I really wanted to love this eye gel, I've heard so many great things about it, however there is one major problem I have and it's one that will stop me buying it again. The pump. It is so hard to get the product out. I either can't get any out or I get way too much out. The whole time I've been using this the pump hasn't worked properly and it's so annoying. Due to that I won't buy this again. If it came with different packaging it would be a lot better. Res says: A light and cooling gel to refresh and revive tired eyes. Arnica, ginseng and jiaogulan extracts reduce the appearance of puffiness while rumex and vitamin p address dark circles under the eyes. Sea grass and natural hyaluronic acid from corn improve the tone and texture of the eye contour providing lasting hydration to facilitate make up application. I do like the way this feels when I apply it. It feels very soothing and my dark circles appear lighter. Unfortunately due to the dodgy pump I haven't been able to use it enough to say if it's effective or not. The girls at Mecca told me they often have trouble with the pump on this product, so hopefully Ren will fix it soon. Ren products contain no petrochemicals, sulfates, parabens, synthetic fragrance, synthetic colours, tea, dea, glycols, silicones, pegs etc. 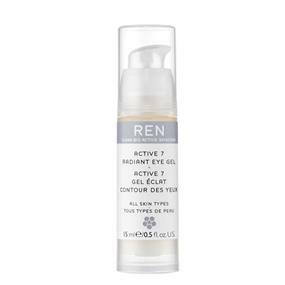 I purchased my Ren Active 7 Radiant Eye Maintenance Gel from Mecca Cosmetica for $55 (AUD). Ingredients: rosa damascena flower water, glycerin, hydrolyzed glycosaminoglycans, zostera marina pectin, arnica montana flower extract, laminaria digitata extract, carbomer, fig fruit extract, phenoxyethanol, panax ginseng root extract, yeast extract, rumex occidentalis extract, gynostemma pentaphyllum leaf extract, sodium hydroxymethylglycinate, sodium hydroxide, sodium benzoate, xanthan gum, potassium sorbate.